Narain Karthikeyan and Karun Chandhok made history last year when they became the first ever Indian duo to compete in the Race of Champions at the Rajamangala Stadium at Bangkok. They helped Team India to the crown of ROC Asia Champions too, another little piece of history in itself. Their performance last year has resulted in them being invited to the Race of Champions for a second time and the Indian pair will compete in the ROC 2013 in December this year. The Nations Cup is scheduled for the 14th of December, 2013, while the individual ROC races will be held on the 15th of December, 2013. 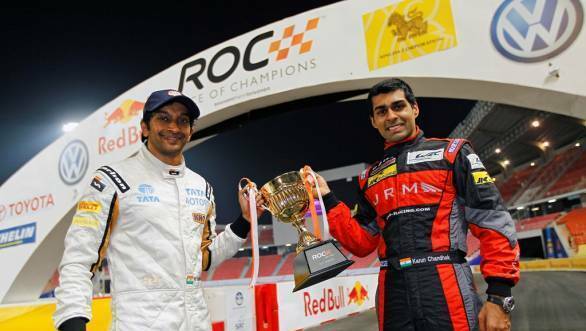 "I'm very excited to be going back to Bangkok for the Race Of Champions," said Karun Chandhok. The driver who is currently competing in the FIA GT1 championship went on to say "Narain and I had a great time together last year and it was fantastic to be the first ROC Asia winners. ROC is a unique event from a competitive and social perspective and it's something that every driver looks forward to. It was really nice to drive such a variety of cars and we both have more experience this year and know a bit more about how it all works." Needless to say, Narain Karthikeyan was also upbeat about the chance to compete in the ROC for a second time, saying "It will be a great privilege to represent India again at the Race Of Champions. We had a great time at our first attempt when we won ROC Asia but it is always a challenge to jump into different cars and adapt quickly. However, with the experience of the 2012 event behind us, we feel more confident and better prepared this time. As always, going head to head with world champions like Michael Schumacher and Sébastian Ogier is something we're looking forward to."